Comforters for Cancer is a non-profit patient-support organization providing beautiful, high quality, inspirational blankets to hospitals for patients to use while receiving treatment at infusion centers. Comforters for Cancer currently distributes blankets to the infusion floors of the Center for Women's Cancer at Dana Farber Cancer Institute in Boston. Our partner, Garnet Hill, help us make it possible to bring these beautiful blankets to patients. Comforters for Cancer was inspired and conceived by Wendy Clayton and her daughters, Michal and Elianna,in the weeks before her death from ovarian cancer at the age of 47. 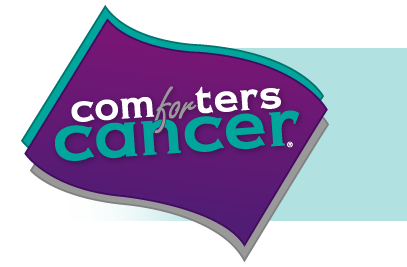 Comforters for Cancer is applying to be a 501(c)(3) non-profit organization. We expect that this will be granted, but we cannot guarantee at this time that your donation will be deductible. Mailing Address: PMB #117 405 Waltham Street Lexington MA 02421-7934Website ©2011 all rights reserved.